The Highway is the country songwriter/singers’ first self-released album on her husband’s (Chris Coleman) label. Produced by Charlie Peacock (Grammy award winner and producer of the Civil Wars) the granddaughter of Hank Williams Sr. and daughter of Hank Williams Jr. wrote or co-wrote the entire album. 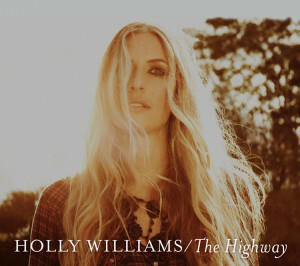 I’ll confess, This is my first exposure to Holly Williams and I’m left only with pure adoration. She is an incredible songwriter – poet if you will – and is equipped with an incredible voice readied with a country feel. Not likely that we’ll hear her songs on country radio therefore let’s cherish her rather “Americana” sound. Pure, simple,beautiful, all country and very unique. Digging into the album, each of her songs attempt to simply tell a story. Williams has a beautiful alto voice which is almost mesmerizing. This is most evident in the song “Railroads”. Her voice takes on a “bluesy” sound and quality in the best song of this album “Let You Go”.The music with this song is bluesy as well but does not lose its’ country sound. Williams also has several well known guest singers on this CD. Jackson Brown sings background vocals in Gone Away From Me. Jakob Dylan sings backup vocals in Without You. His voice blending with hers is really beautiful. Dierks Bentley sings in Till It Runs Dry and Gwynneth Paltrow accompanies Williams on Waiting on June which is an incredible love story starting in childhood and ending with eternity. It is sad but so encompassing we want to keep listening to the end. Williams voice is particularly beautiful in this one. This CD brings back the sound of old country Americana which has been gone for too long, pure country, simple, sweet, story telling country, uncomplicated yet has the same poignancy, the same haunting melodies, the same punch as modern day country, the same mesmerizing effect. We listen, we don’t want to stop, our toes tap, we sing along, we can relate to the story, we never ever want it to stop. Hopefully Williams will continue to release more CDs like this one. Purely, simply beautiful.